Most people appreciate a few extra pounds to spend at December and this page will discuss the various positions available through the festive season such as an elf, delivery and work from home Christmas jobs. Some high street shops and stores will make about 80% of their annual turnover in December. To cope with the demand of more shoppers in their store or shop expecting to see full shelves and buying more than they normally would the shops require seasonal staff. Part time Christmas jobs and positions start to become available as early as September and peaks around November and throughout December. People fulfilling them still get around the same pay as a regular member of staff and a contract of employment, though terms of employment may differ. For example being a seasonal staff member probably will not entitle you to sick pay, a pension scheme or holiday pay. It does give you the opportunity to prove how valuable you could be to a shop or organisation and could be offered a full time or regular part time job. For this reason you should approach them as you would any other employment. Prepare for the interview by finding out about the organisation and the local company. Dress smartly and talk clearly and loud enough. Be polite and respectful. Try approaching larger stores like Argos, Boots and Mark and Spencers. Many people like to shop from catalogues and companies like Kleeneze will pay you to deliver the brochures and catalogues from door to door and you get a commission ranging from 10 - 21% and additional bonuses. We did this and it was one of our best seasonal Christmas jobs. There is an additional start up cost which pays for your shoulder bag, training manual, the catalogues etc. The advantage is it isn’t just for this time of year, but is one that can bring you an income all the year round. Restaurants see a peak in visitors in December as people relax after a busy day shopping or take a lunch treat. Companies and organisations hold office parties for their employees. Restauranters will employ casual waiting staff during December and into the New Year to cope with the increase in visitors. This gives you another employment opportunity. If you impress the owner or the manager of the restaurant you may be offered a full or temporary job when one becomes available. At the very least you may be asked to come back the following year or during staff holidays or periods of illness. Another advantage is the tips you get from happy customers, so do make their meal as enjoyable as possible - a happy customer tips more and gives you valuable extra money. Santa and his little elf helpers makes for a festive season. If you love children and have a twinkle in your eye then this could be a fun job. 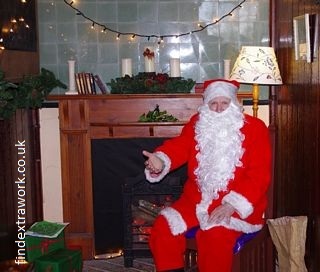 Someone will pay you to chat to children, dress up as Santa or his elves and have fun. Garden centres, shopping malls and larger shops will often have vacancies for someone to give out presents to children and have a talk with them or to pose for photographs with the children by the grotto. These are usually advertised in the local job and employment centres, the vacancies board in the larger shops or in local newspapers. You don't have to have a white beard and big belly to get employed - you'll get a false set of whiskers and a costume! Most Christmas vacancies will pay you one month or on rare occasions one week after completing it. This means you may not get the income until after the New Year because of the bank holidays. It does mean though that if you have been there in the run up, the months September through to November, you will have money to spend before December 25th, which is handy for buying the presents. If you are paid the other side of Xmas you only need budget accordingly. The income earned, and any tips, should be declared on your income tax self assessment form in the paid employment section. Your employer should have paid income tax and national insurance contributions and provide you with a P60 form at the end of the tax year, which is after the 6 April. Though you will not need to pay any further tax the income should be declared on your self assessment form so that the tax office can calculate the tax you need to pay on your total annual income from other work, like those listed on the left and right of this website. You may even be due a tax rebate from over paid income tax paid. The modern PC term is postal worker to encompass postmen and postwomen and there are usually postal job vacancies as a post or parcel sorter in the sorting office or out and about delivering the mail, letters and parcels. Apply at your local postal sorting office for an application form. Adverts do appear in the local paper or job centre round about September and October. Rates of pay vary around the UK and may be higher for busier areas like London, Edinburgh, Cardiff, Manchester, etc. Do expect to be paid above £7 an hour. You will need to be fit and active for this type of seasonal work. There will be standing, lifting and walking involved, but if you are looking for extra money and want to loose weight before your turkey dinner then this is just the job for you. You will need to provide references, be of sound character and preferably have a full and clean driving licence, though you may not need to drive if you have a local route where you can push one of the Royal Mail trolleys or ride a bicycle. An advantage of working for the Royal Mail is that it can give you a taster of what this can be like and could lead to a permanent job. Regular posties have perks such as a pension plan, paid holidays and extra days off on bank holidays. Find more information at the Royal Mail website at www.royalmail.com where you can search by location and shift. Follow the link through and enter your postcode and the number of miles you are prepared to travel. Optional search requests include casual, counter staff and postperson delivery or indoor sorting on a temporary engagement contract. Do apply early for a postman or postwoman job because they often close the positions early because they get such a high volume of applicants. Some of the major cities will hold recruitment days. There can be a huge demand as can be seen in recent figures. Over 80,000 applications were received for the 18,000 vacancies. These were to supplement the 130,000 full time staff. The Royal Mail revealed that this was 10,000 application forms than received the year before. These were broken down to 2000 for Scotland, 1000 in London, 1500 for the North West of England, 1500 for East Anglia, 2000 for the Thames Valley, South East and South West of England, 3000 for the Midlands, 1000 for Wales and 400 for Northern Ireland. In October it was announced by various media sources that they were advertising between 15000 and 30000 to help cover the backlog caused by industrial action and strikes by the Communications Workers Union (CWU). Whilst this may seem good news to those seeking them it is felt by many that it could be a double edged sword because companies looking to new couriers and postal delivery services during a strike may prefer to continue to use a different one such as TNT and DHL. It is thought that some online shops and stores such as Amazon and John Lewis may already have changed to a courier service to prevent delays. The Sell Hampers Page is another earning opportunity you may wish to consider.